THE BEST TITLE RACE IN HISTORY? This season's North Devon Premier Division title race looks like it could go right down to the wire.But it is doubtful whether this, or any other, season will ever match the tension-filled climax of the 1996/97 campaign. In what is widely regarded as the league's most exciting finale ever, Shamwickshire Rovers travelled to Fremington needing a last-day miracle. Trailing their hosts by three points, the East-the-Water club had to beat their title rivals by four clear goals to pinch the silverware on goal difference. In the event, Shammy overcame the odds to record a stunning 7-2 win with three of those goals coming in a frantic late spell. Kevin Mugford, Mark Stevens and Elliot Waldron each scored twice while long-serving skipper Michael Hookway weighed in with a vital effort. In his match report at the time, former Journal sports editor Dave Pedler wrote: "If you weren't there, you won't believe it. I was and I'm still not sure that I do!" 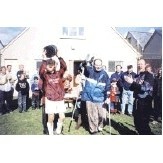 "There can't have been a more dramatic or emotional climax to a league season in the history of North Devon football." It was a day that former Shamwickshire manager Neil 'Nipper' Peake will never forget. "I remember saying to the boys before the game, if anyone can do it, we can," he recalled. "We conceded quite a few goals that season, but we were always one of those sides, where, if they scored four goals, we would score five." Shammy's title hopes looked to be fading in the final weeks of the season when popular goalkeeper Russell 'Sumo' Young was seriously injured in an accident at work. Eventually, Nipper had to don the gloves himself and, two days before the Fremington game, he played in the Brayford Cup final when Shammy hit back from 2-0 down to beat Bradworthy 3-2. After visiting Sumo in hospital with the cup, the Shammy squad were stunned when he turned up to cheer them on at Fremington. "He was seriously ill at the time but he was determined to get down and watch the game," said Peake. "There was a hell of a crowd up there - probably the biggest crowd I've ever played in front of - and everyone there said no one will ever win it like that again. For it to all boil down to that last game was mental. "I always remember Michael Hookway crying in the changing rooms after the game, he couldn't believe it. "He'd been at Shammy for 20 years and for anybody who plays football in North Devon, the aim is always to win that Premier Division title." Colin Pepper's Fremington had a reputation for playing attractive football but they found Shamwickshire's uncompromising approach difficult to deal with. "I always thought Fremington were easy to bully," said Peake. "A good, fit, hard side would always give them a lot of trouble." "They were a good footballing side, you can't take that away from them; when they had the ball, it was difficult to get it back. But we had the edge with the physical side and we were so fit." The epic victory was the start of a golden era for Shamwickshire as they went on to win the Premier title five times in seven years. The club gained a fearsome reputation for its competitive nature and, even at training, there was always an edge to the way they played. "We would play a lot of 5-a-side and every week it would end up being an absolute war - we used to kick lumps out of each other," recalled Peake. "I always told them 'a good whinger is a good winner'. "Players like Kevin Mugford and Gary Suggate used to whine for England. They would grizzle if I ever went to take them off; they wanted to play in every minute of every game. "We all ended up as brilliant friends and some of the laughs we had were unbelievable "All the boys were absolutely brilliant and I sometimes think I'd like to turn the clock back." That crazy-gang spirit even saw players letting fire crackers go off inside the changing rooms and the infamous Nipper-kipper incident. "I told everybody to bring in a kipper one day," recalled the boss. "Dave Loder was the ref and after the game, we stuffed about 12 kippers into his kit bag. They must have been stinking when he found them on Monday morning!"